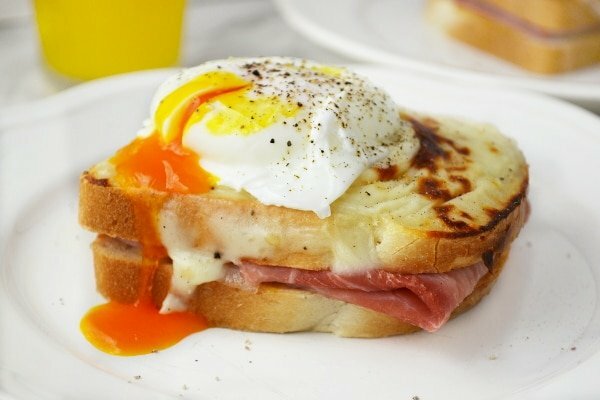 Croque Madame – mustard and ham toasts topped with a cheesy bechamel sauce and a perfectly cooked poached egg. Breakfast heaven. Happy Hump day everyone! I’ve just arrived back from a wonderful break in Venice and have a case of the holiday blues and a very heavily dented wallet. Venice is absolutely beautiful in every way! As we arrived at the train station and stepped outside it felt like we had just stepped onto some sort of magical film set and I was bursting with excitement! There were gondolas drifting by with the gondolieri singing ‘That’s Amore’ (totally cheesy but I loved it), the sun was shining, blue skies and our taxi boat awaited us! It was everything I imagined. We ate some delicious food whilst in Venice but let me tell you about our highlight of the whole trip. It was a cute little place called Osteria Enoteca Ai Artisti which had such a romantic ambiance. We sat outside on a small little candle lit table for two and ate some of the most delicious food we’ve ever tasted. My first course was pumpkin cream with squid which was a pumpkin puree with ginger and capers topped with perfectly cooked squid and shavings on fish roe. It was absolutely delicious to say the least and I enjoyed every single bite, one of those you wish would never end. Nathan’s first course was tagliatelle with spider crab and wild herbs, it was sweet and utterly delicious (the little mouthful he let me try). For our second course I had a perfectly cooked tuna steak with balsamic baby onions and ‘Nduja mayonaise (which was to die for). If you’ve never heard of ‘Nduja before check out my post here it’s a delicious spicy spreadable salume from Calabria that you need to try. Nathan’s second course was seabass which was again cooked to perfection with a tomato and ginger sauce and curry pesto, he would’ve licked his plate if we weren’t out in public. Of course we had to have dessert, which was deconstructed Cassata cake with wild berries and Campari sauce and a classic Tirimisú. Yum, yum and just yum, all the courses were absolutely outstanding and totally worth the higher than average price tag, I would definitely recommend this restaurant to anyone who is visiting Venice. It’s an absolute must. Now let’s talk about this bad boy right here. Yes, something to take the edge of the holiday blues was very much needed and what better way than Croque Madame. 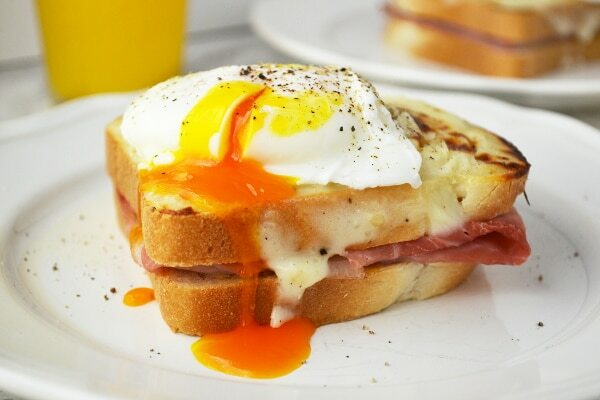 A yummy mustard and ham sandwich topped with a cheesy sauce, placed under the grill until golden brown then topped with a perfect poached egg. Oh yes this is the ultimate breakfast indulgence and let’s face it anything with cheese sauce on top has gotta be good. 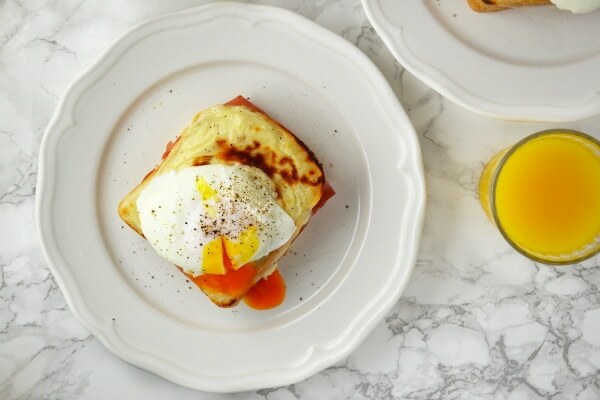 Croque Madame is a French dish that traditionally is made with Gruyére cheese and is fried in butter topped with a fried egg. 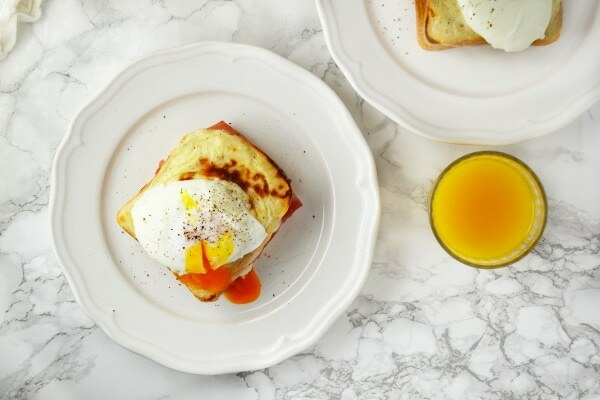 I make my own version with cheddar cheese which is also just as delicious and much cheaper than Gruyére ( in Italy anyway ) and I top mine with a poached egg which is my absolute favorite way to eat eggs. This is so easy to make it would be silly not to, honest it takes around 15 minutes to make and if you’ve mastered your poached egg making skills then it maybe takes even less time. To achieve perfect poached eggs can be quite tricky but after a few practices and some weird looking eggs it becomes easy and they come out perfect almost every time. It’s important to slowly pour the eggs from a ramekin into the water, the slower the better also the temperature of the eggs make a difference too I always find my poached eggs work best at room temperature and not just out of the fridge. Now let’s get to the recipe and all it’s deliciousness. Don’t forget to follow me on Pinterest for more mouth watering recipes. You can pin this very recipe to save for later below. Croque Madame - mustard and ham toasts topped with a cheesy bechamel sauce and a perfectly cooked poached egg. Breakfast heaven. Preheat the grill to 180°C/350F/gas mark 4. Spread one side of each slice of bread generously with mustard then top 4 slices with a slice of ham and close to make a sandwich, place on a baking tray. Bring one large pot of salted water to the boil. To make the cheese sauce add a large knob of butter to a sauce pan under a medium/low heat. Once the butter has melted add the flour and mix to a thick paste. Cook down for 1 minute then gradually add the milk, stirring with a whisk constantly so there are no lumps. Add the nutmeg and season with salt and pepper. Turn off the heat and add the cheese, stir until melted and the sauce it thick and smooth. Top each sandwich with white sauce then place under the grill until golden brown. Meanwhile to make the poached eggs, turn the boiling water down to the very lowest heat possible, you don't want the water to be simmering at all, if it does on the lowest heat turn it off. Crack the eggs one at a time into ramekins and slowly pour the eggs into the water. Poach for about 2-5 minutes depending on how runny you want your egg. Remove with a slotted spoon and dry off on kitchen paper before topping each sandwich with a poached egg, season with salt and pepper. Please note all imperial measurements are an approximate. This is my favourite thing to make when I have people staying, delicious! Ahhh my dream is to go to Italy! Venice is definitely on the list, especially bc of the gondolas. I told my husband that we’re not having children until we get to enjoy the sights and tastes of Italy, firsthand. So we’ll see how that goes…haha. Oh man. 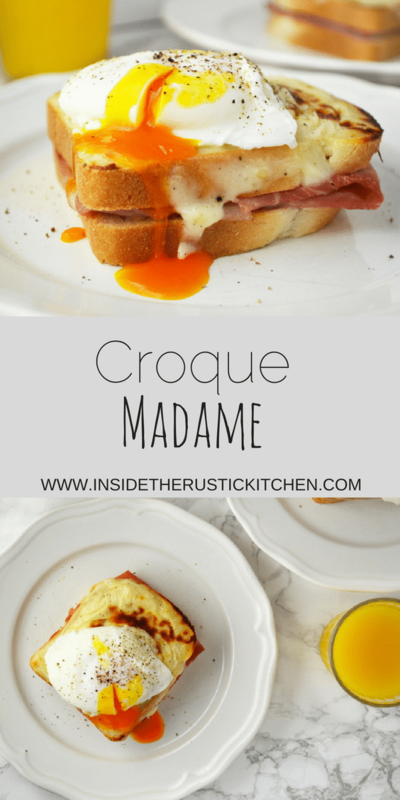 I’ve been eating croque madames way before I knew it was a croque madame. But I put the egg in the sandwich. I think you’ve convinced me to finally try making a poached egg. I’ll let you know how it goes! 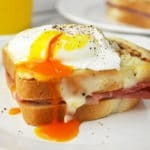 One of my favorite all time sandwiches and your poached egg looks perfect! I wish you were my next door neighbor! I love that runny egg on top! yum! This is what I call comfort food! That egg looks perfect and I can’t wait until baby arrives and I can have a runny yolk again.